A PhD student at the University of Copenhagen has drawn on nature’s own pharmacy to help improve the treatment of snakebites in Africa. Marianne Molander from the University of Copenhagen's Faculty of Health and Medical Sciences has been working within a Danish team that has examined various plants native to the African continent in a bid to find locally available herbal antidotes. “Snake venom antidotes are expensive, it’s often a long way to the nearest doctor and it can be difficult to store the medicine properly in the warm climate. As a result many local people rely on natural resources for treating potentially fatal bites,” says pharmacist and PhD student Marianne Molander. “We have particularly focused on the snake species Bitis arietans, which is widespread south of the Sahara. All snake venoms consist of a unique cocktail of enzymes, which results in rapid tissue death. Along with our African partners, we are currently testing plants that act as venom antidotes in remote regions of Africa. A hundred plants from Mali, 27 from South Africa and 13 from the Democratic Republic of Congo are now under the microscope," says Marianne Molander, PhD student in drug design and pharmacology at the University of Copenhagen. 100,000 people worldwide die each year from snakebites. Three times as many suffer permanent injuries, disability or amputations as a result of a bite to an arm or leg. The problem is greatest in tropical developing countries, where agricultural workers, women and children are the most likely victims. Although a million people in Africa are bitten by snakes each year - only half receive treatment. But snake venom is not all bad. There are many instances where venom can be developed into drugs used, for example, in the treatment of hypertension, heart failure and diabetic kidney disease. 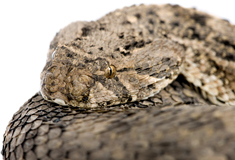 The drug Aggrastat, which is used for chest pain, was developed using a peptide from an African viper. Historically plants have always been a major source of drugs. A quarter of all new medicinal products registered worldwide, come from plants or other natural resources. This impressive potential has its origins in the fact that plants have evolved to contain substances that prevent them being eaten or attacked by diseases. These biologically active defence compounds can sometimes be useful for developing new drugs. And Africa’s poor use nature as their medicine cabinet. “In Africa where much of the population can’t afford medicine, there is a tradition of seeking out healers and alternative therapists, before turning to conventional medicine. Eighty percent visit the healer before they go to the hospital. Traditional herbal medicine is based on centuries of traditions and achievement, so the local shamans and medicine men are often a good place to start when you are looking for active substances with real pharmaceutical effects,” says Marianne Molander. Mobile: +45 40 87 48 76. The world’s 3.000 or so species of snake are divided into 18 families. The bulk of the earth’s snake population belong to six families: Colubridae (colubrid snakes), Boidae (boas) Pythonidae (pythons) Hydrophiidae (sea snakes), Elapidae (elapid snakes) and Viperidae (vipers). Most of the poisonous snakes that are dangerous to humans belong to the last two families. Sea snakes are extremely toxic indeed, but rarely bite.